There are 2 ferry routes operating between Estonia and Finland offering you combined total of 91 sailings per week. Tallink Silja operates 2 routes, Tallinn to Helsinki runs 6 times per day & Tallinn to Mariehamn about 7 times weekly. Viking Line operates 1 route, Tallinn to Helsinki which runs 3 times daily. Eckerö Line operates 1 route, Tallinn to Helsinki which runs 3 times daily. As the frequency and duration of crossings on some routes varies we would advise that you do a live search for crossings from Estonia to Finland to get the most up to date information. Estonia is a small country in north-eastern Europe with almost two thousand islands and islets in the Baltic Sea. Voted the ‘world’s best value destination' in 2016 by travel guide, Lonely Planet and regarded as one of the greenest countries on the planet, Estonia is up-and-coming and it’s easy to see why. The capital, Tallinn is one of the continent’s most charming, characterised by a vast network of fortress walls, baroque architecture and countless restaurants. Also, aside from gorgeous cities, around half of the country’s landmass is blanketed by lush forest and untouched wilderness, including several UNESCO listed areas. Estonia is well connected with the surrounding nations by ferry, making it a useful departure point for Scandinavia and Russia. Frequent crossings are available across the Baltic Sea and the Gulf of Finland, all operated by leading ferry companies. Finland is a country and large peninsula in northern Europe, with Sweden to the west and Russia to the east. ‘The land of a thousand lakes’, which is actually speckled with around 187,888, is also known as ‘the land of a thousand islands’, making it one of Europe’s true great wildernesses. Also, given the vast volumes of water in Finland, it offers sublime kayaking and canoeing, too. 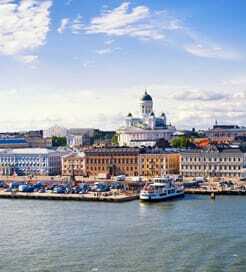 The capital, Helsinki sits on a large south coast harbour and is by far the most densely populated area in Finland. It boasts a fully flourished art scene alongside an innovative gastronomic culture, with highly trained chefs serving locally sourced food served in brand new eateries all over the city. With numerous routes from Sweden across the Gulf of Bothnia, from Eastern Europe across the Gulf of Finland and from Germany across the Baltic Sea, travelling by ferry is a great way to reach the Finnish shores. These routes are operated by a wealth of excellent ferry companies, operating large fleets of luxurious vessels.